Vitamin A is a micro nutrient essential for our body. Vitamin A is needed to build body tissues, helps metabolism and strengthen the immune system. Benefits of Vitamin A lot, associated with the eye. But in fact, vitamin A also has many other benefits. Vitamin A is a fat-soluble vitamin. Inside there are compound such as retinol, retinyl palmitate and retinyl acetate. Retinol is a compound that has the most roles in the body. Vitamin A is essential for the maintenance of corneal cells, helping the growth of bones and teeth, the formation and regulation of hormones, as well as protecting the body against cancer. Vitamin A plays an important role in the formation of the sense of sight. This vitamin will help change the signaling molecules of the rays or light, received by the retina, to be a projection of the image in our brains. Vitamin A can help cells to reproduce normally. If the cells can not reproduce normally it could turn into pre-cancerous. 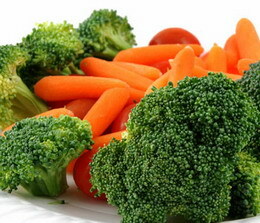 Vitamin A is also very good for pregnant women. Because it can assist the growth and development of the embryo and fetus, and will affect the genes for the development of organs. Vitamin A protects the body from foreign organisms infections, such as bacterial pathogens. This vitamin will increase the work activity of white blood cells and antibodies in the body, so the body becomes more resistant to toxic compounds or parasitic microorganisms attack. There are several signs and symptoms that can be recognized if the person is deficient in vitamin A. The symptoms are include having night blindness or difficulty seeing at night, an inflammation of the skin till become infected, to anemia. In addition, vitamin A deficiency can also affect the growth of bones and teeth, till nerves. This could have an impact on tooth decay, bone deformation up to cause paralysis. Vitamin A deficiency can occur as either a primary or secondary deficiency. A primary vitamin A deficiency occurs among children and adults who do not consume an adequate intake of yellow and green vegetables, fruits and liver. Early weaning can also increase the risk of vitamin A deficiency. Adequate supply of Vitamin A is especially important for pregnant and breastfeeding women, since deficiencies cannot be compensated by postnatal supplementation.. However, excess Vitamin A, especially through vitamin supplementation, can cause birth defects and should not exceed recommended daily values. Animal liver is a very rich source of vitamin A. It has been found that 100 g of liver (beef, pork, turkey, fish) contains about 6500 mcg of vitamin A. Carrot. If you are vegan and looking for dietary vitamin A sources, then eat raw carrot daily. It is said that 100 g of raw carrot has 836 mcg of vitamin A content. Sweet potato. Sweet potato is also very rich in vitamin A content. 100 g of sweet potato has 709 mcg of vitamin A. Spinach. Spinach too is quite high in vitamin A content. 100 g of spinach has 469 mcg of vitamin A. Cheese. Just 100 g of cheddar cheese can provide 265 mcg of vitamin A.
Cantaloupe melon. Another rich source of vitamin A is cantaloupe melon. 169 mcg of vitamin A is present in just 100 g of it. Eggs. Eggs are also excellent source of this vitamin and 100 g contain 140 mcg of vitamin A.
Apricot. By taking just 100 g of apricot daily, you are taking 96 mcg of vitamin A.
Papaya not only helps in digestion, but is also a good source of vitamin A. From 100 g of papaya you can derive 55 mcg of vitamin A. Broccoli. You can get 31 mcg of vitamin a from 100 g of broccoli. Mango and peas both contain trace amount of vitamin A. for every 100 g, 38 mcg of vitamin is present. Milk. Milk is not only a rich source of protein, but other nutrients too. 100 g of milk contains approximately 28 mcg of Vitamin A.